An ordinary wine from an ordinary producer. Nevertheless, this wine has not only managed to survive nine years of cellaring, but even evolved to become really good. 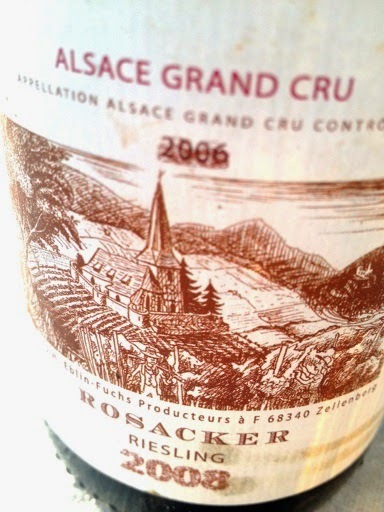 The wines of Alsace never falls apart like house of cards when they get a few years old. They get their long lives thanks to fine terroirs, gentle winemaking and that the producers are not so greedy and arrogant as in some other districts. 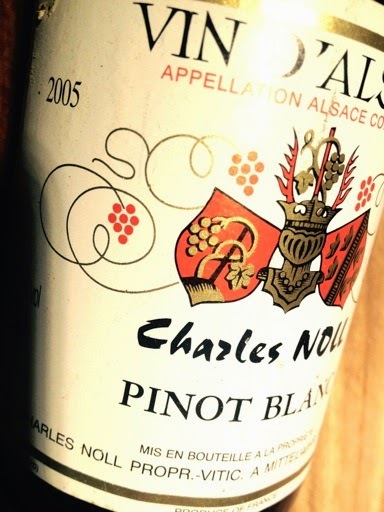 2005 Pinot Blanc from Charles Noll in Mittelwihr is deeply greenish golden in color. The scent is powerful with honey, wax, vanilla and fresh apricots. The taste is medium bodied with good structure, clear and ripe fruit and a pretty intense acid that gives a good spine. Quite a long, dry aftertaste where the fruit is surprisingly youthful. Price (2014): € 5. 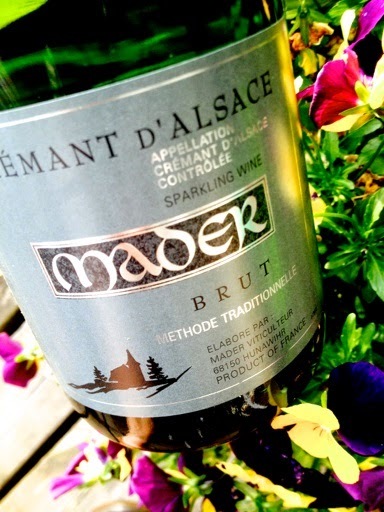 Crémant sells better and is becoming increasingly important for Alsace. The quality is increased by less use of Pinot Gris and Auxerrois for the benefit of Chardonnay and, not least, the Pinot Noir. Nowadays, you often see the vintage on the bottle as well as the dates of degorging. More serious. Even tastier. And still as ridiculously cheap. 2010 Crémant d'Alsace from Jean-Claude Buecher in Wettolsheim offers hazelnuts, orange marmalade, sponge cake and strawberries on the nose. The palate is rich, full and harmonious with wonderfuly firm acids, perfect mousse and velvety fruit in the finish. The dosage is 6 grams/liter, and the grapes are Pinot Noir, Pinot Blanc and a splash Auxerrois. Degorged in March 2014. Price (2014): €7.90. Mittelbergheim is one of France's most beautiful villages, situated on a south-facing slope just south of the town of Barr. In the village there are producers with completely different style; Gilg makes wines with volume and a little sweetness, Rietsch is experimenting with natural wines, Rieffel does strictly classical wines, while André Rohrer makes wines that are dry. Very dry! 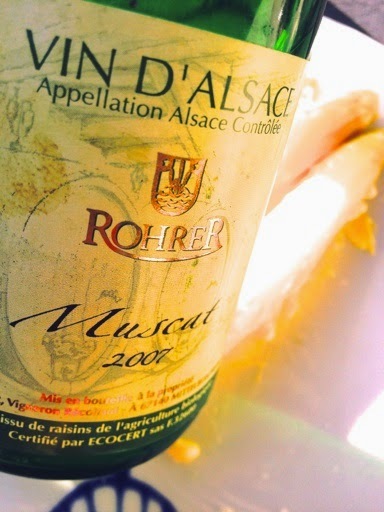 2007 Muscat from André Rohrer in Mittelbergheim has a bright greenish-yellow color. The scent is fresh, complex and intense with lemon, mint candies, wet gravel and orange flowers. The flavor is barely medium-bodied and bone dry with wonderfully ripe fruit, pure fine acids, a slight astringency and the long finish is supported by an absolutely pure acidity. Who says that Muscat does not gain from cellaring? Price (2008): € 5. 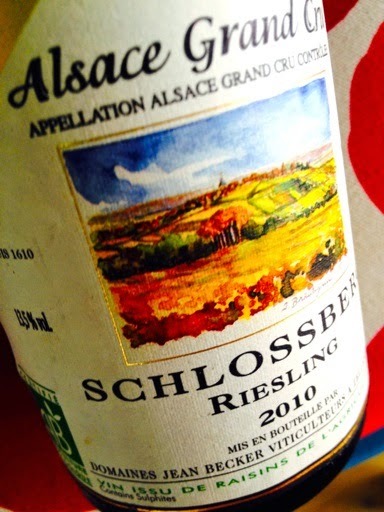 2010 Riesling Grand Cru Schlossberg from Becker in Zellenberg has a deep yellow color. 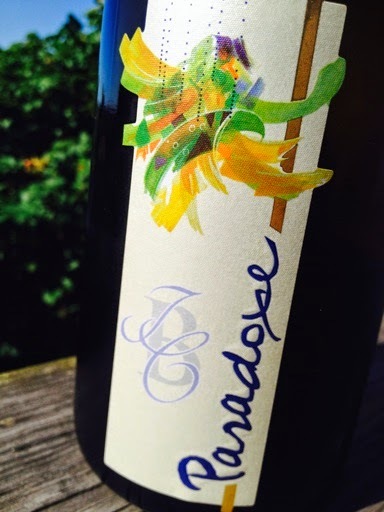 The nose is big and fruity with notes of orange, pineapple, acacia and mineral. The flavor is quite supple and clean with a wonderfully lively acidity that embeds the generous fruit, while there is a tantalizing saltiness in the finish. A really, really good wine from a reliable producer. Price (2014) € 16.00. 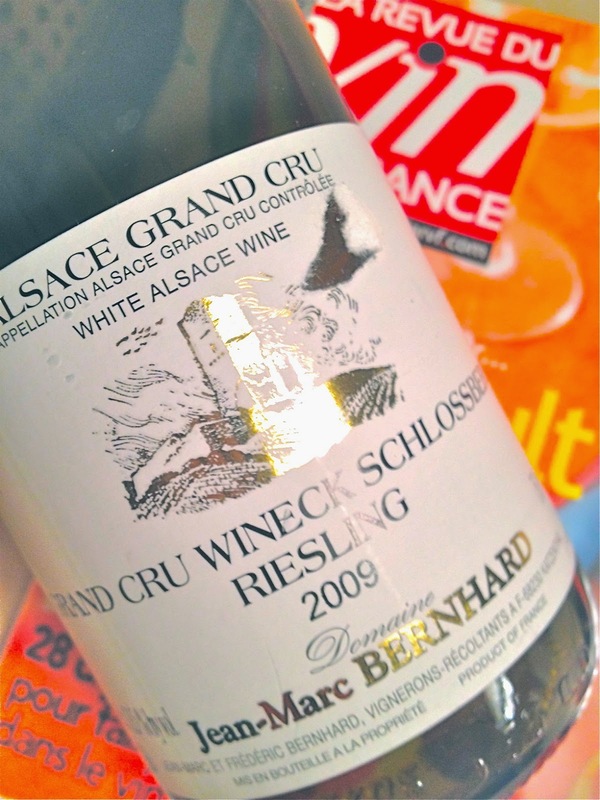 Alsace wines from green grapes such as Riesling, Gewurztraminer, Muscat, Sylvaner and others normally carries the grape variety on the label. But this presupposes that the wine is white. If the color deviates from the standard, it merely meets the requirements to be sold as Vin d'Alsace grape but without grape designation. Since some years, Domaine Loew makes a true rosé of Sylvaner by allowing the skins to be present during the fermentation. Then the alcohol out extracts red/blue colored anthocyanins from the skins, enough for the wine to be become discolored in the legal sense. 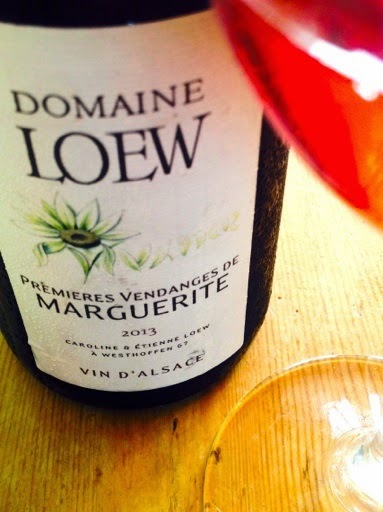 Premieres Vendanges de Marguerite from Caroline and Etienne Loew in Westhoffen has a bright pale red color. The fragrance bursts with strawberry, raspberry and forest honey. The taste is light and tangy, with an acidity as of cranberries with a nice berry fruit, and a small roughness in the completely dry aftertaste. A wine that is not only made ​​of organic grapes, but is a genuine Vin Biologique that has been vinified with a minimum of intervention. Fun! Price (2014): € 8.90. 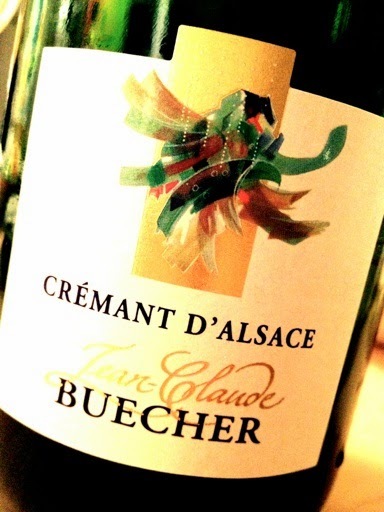 Jean-Claude Buecher makes only one type of wine: Crémant d'Alsace. Born into a family of wine growers in the late 1950s, he soon became an orphan. But the mother and teenage children chose to fight on as independent producers, against all odds. And when Jean-Claude in 1980 married Sylviane, also from Wettolsheim, the acreage increased to an economically sustainable level. The strategy - complete specialization - was staked out. 2005 Crémant Paradoxe from Jean-Claude Buecher in Wettolsheim has a greenish yellow color. 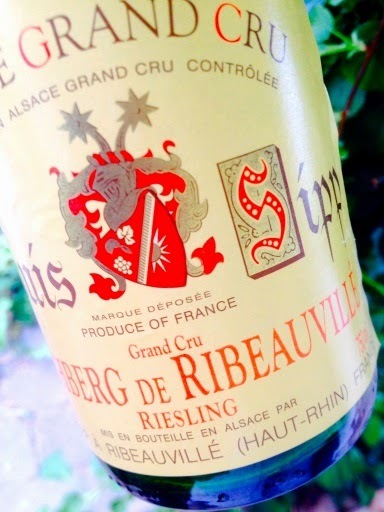 The nose is very expressive with citrus, mineral, green apples, brioche and nuts. Intense, complex and very tight palate with lovely fruit, salinity and a clean, deliciously chiseled out finished. Completely dry. Stored over eight years sur lattes. Just amazing! price (2014): €13.10. Asia represents a huge market for wine. As the purchasing power is rising in countries like China and Vietnam, while Hong Kong (yes, I know it is a part of China ...) and Singapore will be – if possible – more open to western gastronomic influences, more wine will be consumed. In Singapore, Australian wines certainly dominates, but people like Etienne Hugel and Christian Beyer works intensively on the Asian markets. 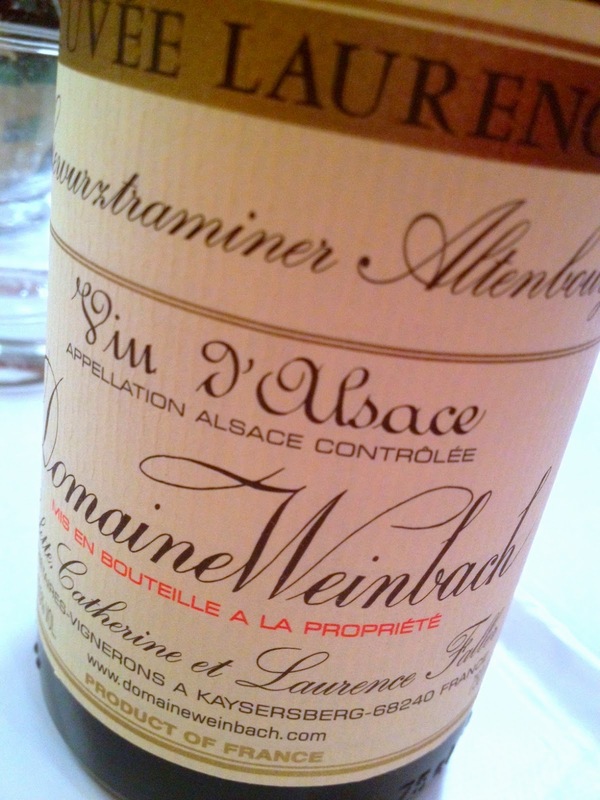 No wonder, for Alsace wines are versatile and can be combined with all kinds of Asian food. Rather neutral wines work best, for example those based on the too often neglected and overlooked Sylvaner. 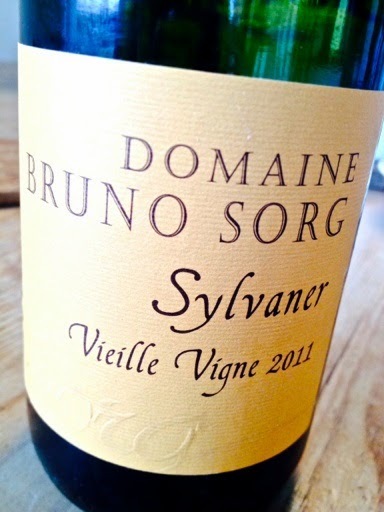 2011 Sylvaner Vieille Vigne from Bruno Sorg in Eguisheim has a rich aroma of pineapple, chocolate and fresh, chopped oregano. The taste has significantly punch with generous fruit, vigorous acidity and a tiny, little hop-style bitterness in the balanced, almost dry aftertaste (vintage 2012 is bone dry). Perfect for a fish soup Laksa style. Ridiculously cheap. Price (2014): € 5.00. Blanc and Auxerrois are grown on just over 20% of the area. In the statistics they are pooled, but in nature they are different. Pinot Blanc is light and tight, while auxerrois is much fuller and softer. As more and more Pinot Blanc is used for Crémant it will be increasingly difficult to find still white wines made from 100% of real Pinot Blanc. 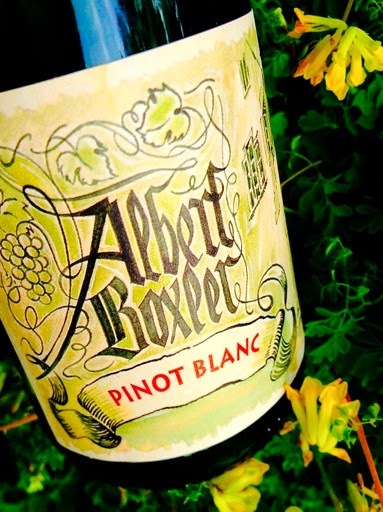 2010 Pinot Blanc from Albert Boxler Niedermorschwihr has a dense, yellow-green color. The aroma reminds of creamy milk chocolate, almonds, ripe yellow apple, mineral and nectarine. The taste is compact, tight and stringent with lots of lovely fruit, a sandy mouthfeel and absolutely perfect balance, despite the soaring acids. Boxler makes incredibly good wines! Price: € 10. 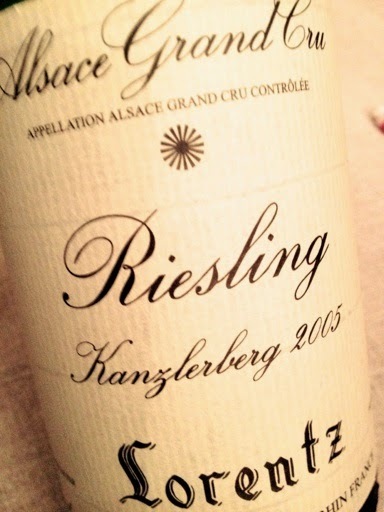 As in all other wine regions are Alsace wines do not reach reasonable standards There are acidic Riesling, sticky Gewurztraminer and limp Pinot Gris. 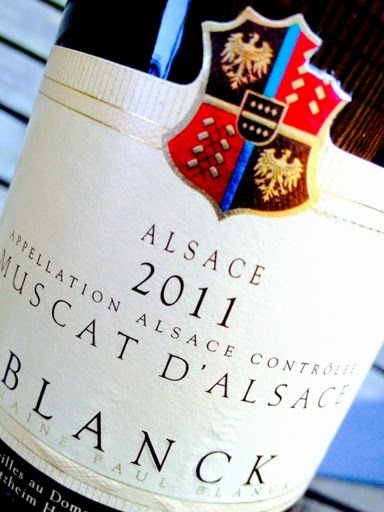 But Muscat from Alsace are of a consistently high standard. Perhaps it might be because the grape variety is so fragile and delicate, and the cultivated area is so small. Or perhaps because Muscat wines are associated with summer, asparagus and good friends who meet for a fresh and seductive glass of the most lovable of all wines. True and pure joy, in other words. 2011 Muscat d'Alsace from Blanck in Kientzheim have fairly deep yellow color. The fragrance is developed but focused and offers orange, mineral, lemon balm and crushed grapes. The taste is barely medium-bodied and quite dry with deep, dense fruit, ripe and clean acids, fine texture and a lovely saltiness in the finish. The wine comes largely from Grand Cru vineyards. Class all the way through, at a ridiculously low price. Price (2014): €11. Grand Cru Kastelberg is the only one of Alsace's finest vineyards are located on the slate. This rock is made up of sedimentary layers of clay particles of easily weathered minerals. Typically the rock has been transformed to become hard, brittle and flakey. Because shale releases much minerals, while it is dark and well drained, the vines on Kastelberg gives a unique character to the grapes which ripen perfectly. 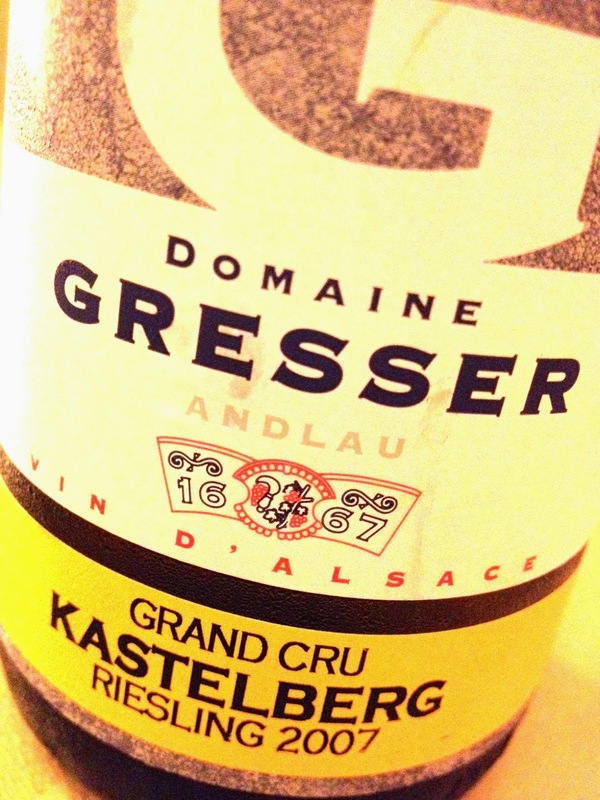 2007 Riesling Grand Cru Kastelberg from Gresser in Andlau has developed aromas of licorice, citrus and minerals with a hint of cardamom, acacia and smoke. The flavor is quite full with layers of ripe fruit, stringent acidity, excellent structure and absolutely first-class balance. The aftertaste is fresh and very, very long. Price: € 20. The domaine Martin Schaetzel has a distinguished set of vineyards all the way from Thann in the south (Grand Cru Rangen), via Colmar (Grand Cru Eichberg and Pfersigberg) and Ammerschwihr (Grand Cru Kaefferkopf) to the slopes just south of Colmar. From this diversity, Michel Vié produces wines that are dry or sweet, light or robust as well as fruity or filled of minerality. Everything is made with the same fabulous precision, and will never disappoint. 2010 Riesling Ammerschwihr from Martin Schaetzel in Ammerschwihr is a pretty light yellow color with hints of green. The fragrance is clean, fresh and full of minerals, citrus, acacia and one hint of honey. The palate is medium-bodied, pure as crystal with lovely acid, ripe fruit, distinguished structure and stringent purity. Classic! Price: € 11.40. 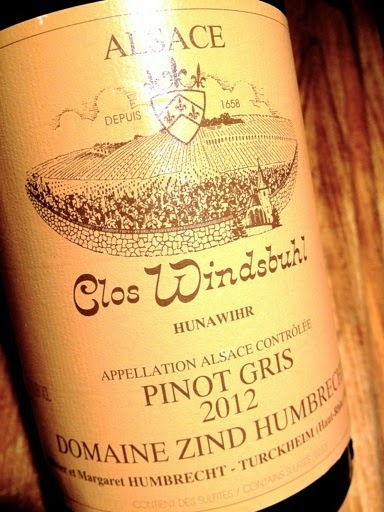 Pinot Gris can be wonderful on the table. With its rich, full-bodied flavor and complex aroma the grape manages to match and balance the most kinds of food. But this requires that the wine has good acidity, moderate sweetness and is not too high in alcohol content. 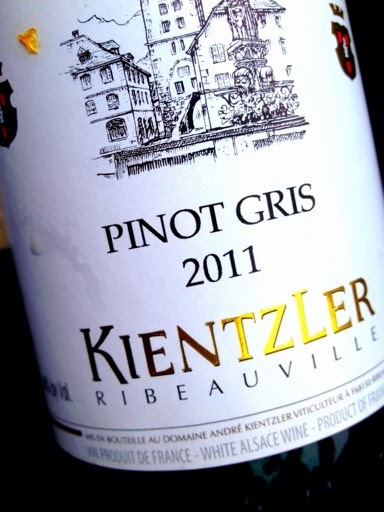 A producer who always manages to create gastronomic Pinot Gris is Kientzler, which houses just outside Ribeauvillé. But on the other hand, Kientzler succeed with just about everything. Always. 2011 Pinot Gris from Kientzler in Ribeauvillé have a pretty pale yellow color. The scent is youthful and fresh with hints of fresh apricots, orange, oregano and a touch of honey. The palate is medium bodied with a bit coarse mouthfeel, high but not aggressive acids and wonderfully ripe fruit that is long in the finish. So good! Price: € 9.